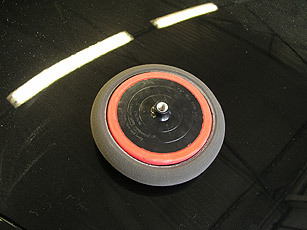 Polish at high speed with large buffing pads. 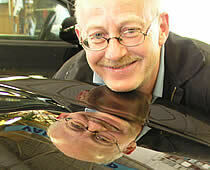 Many car care detailers are “scared stiff”, when it comes to buffing with large pads at a high speed. The fear of Swirls and Burn marks makes car care detailers avoid the most effective method there is for polishing car paint. The results you achieve are superior to other methods normally used today. Not using High Speed Buffing can limit your possibilities in many ways, including more satisfied customer and a much improved result. And by this you are able to charge a higher price for your services. Below I will give you some information about High Speed Buffing, hopefully to tune down the fear, but also to give some tips to the ones who have the experience and use the method already today. Equipment: You need a buffing machine, with variable speed (600 – 2400 rpm, min 1400 watts). And various pads (200 mm), easy to change, and you need a spur and a brush to clean the pads. Chemicals: In this case waxes, polishes, compounds. The market can offer a million different kinds. Use the products you are most familiar with. Knowledge: In this case it means knowledge about the condition of the paintwork of the car, colour systems and how to identify problems and solve them. First of all I will explain the difference between a rotary and an oscillating machine. The back plate on an oscillating rotates in two different ways; a slow circular in combination with an oscillating movement. But it is also so that the oscillating movement happens in a distance outside the centre, to mimic the motion of polishing by hand, but at much higher speed. Heat does not develop at all and it is not easy to harm the paint work, even if you use a very aggressive compound / polish. A rotary machine on the other hand creates both friction and heat due to high speed, and that a more concentrated area is treated. It is the heat and the friction which gives the rotary machine an advantage over the oscillating machine. The heat softens the paint so that the friction easily reduces defects. This is also the reason that the rotary machine can cause injuries to the paint in a second!. In the last and final process the heat also has a polishing effect – the paint kind of “melts”, that is why you can adjust small scratches that appears while working until you reach a deep gloss and shiny result. 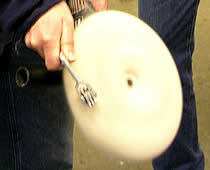 Swirl marks caused by a rotary machine, can only are removed by a rotary machine. At its best an oscillatingmachine can in combination with wax reduce the swirls or hide them, but to remove them totally is not possible. Polishing pads are delivered in several different shapes and sizes. They are round with different surfaces and mixtures. 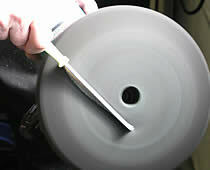 Polishing pads comes in different sizes from 100 to over 200 mm . Most car care detailers are using 150 mm pads, even if the 200 mm pad size creates more heat and gives a faster and better result. Allbrite Car Care Products USA are happy to announce the AllPad system. The pads are manufactured from a very durable cell foam (Euro foam) and are delivered in different colours for different specifications; red, orange, blue, green and black, where red is used for heavy cutting and the black for finishing. The cell structure varies, so you can always pick the right pad for the job. The pads are 200 mm in diameter and are easy and fast to change during work. The backing plate is so constructed that the pad is easy to adjust into the centre, with the top of your finger. In the system we have also added a pad of 4-ply wool threads for very heavy cutting and one pad of non spun natural lamb’s wool giving splendid finish result – after you waxed the car! It contains natural oil which removes the smallest micro scratches and as a result you get an even deeper shine. When you clean the wool pad you must use a spur – and often, many times during work! When the working day is over, remove the pad from the machine and leave it to dry with the wool side up. Next day you simple use the spur, with the machine running at low speed and practically all grits will disappear. I recommend not to wash the wool pad at all. If you do the structure of the pad will change and it can shrink. Follow my instructions and the pad will hold for many, many cars. But remember and old and worn out pad can harm the paint and can cost much more then buying a new one. Normally, foam pads have not the same cutting effect as wool pads, but produce much more heat. This is why foam pads are used for the finishing work, but also for paint works to adjust small damages and small scratches that can remain. The foam pads have been developed and are today almost as good in cutting effect as the wool pad. As are our AllPads!